Software providers continue to break ground in new platforms to expand their games catalogue to wider audiences, and one such recent development has been making online casino games available on your iPhone. Due to Australian legislation, apps which offer real AUD money options are not available for download to your iPhone from the App store – with the exception of the official Royal Vegas Casino app, called ‘Regal Vegas’, which unfortunately does not contain any keno games within the app. Nevertheless, for those who are after iPhone keno apps to play for free, we have compiled some of the best ones for you to check out, while also offering an alternative to apps if you are after real money keno. Keno apps are free to download and free to play, but this means there is no chance of betting, or winning, any money. Type these titles into the search bar in the App Store or just search for ‘keno’ for an endless array of titles. Despite being free, you still need an account with iTunes, but iPhone users generally have to create one when they first activate their smartphone. Keno Gold features the standard keno gameplay as well as additional free games, extra balls, and multipliers for a unique variation. It has been created by mobile games developer Bimza, who have an abundance of keno titles for iPhone use such as Keno Tap, Keno Trek, Keno Fairies. Keno Gold features an all-in-one layout, with the pay table, and ‘Go’ button down the bottom, which is what you press when you are ready to play, while the keno spots are up the top. With a green leprechaun theme, the game is somewhat a novelty, but it can help you understand the basics. There’s also the ability to speed up and slow down the game by tapping on the ‘speed’ icon. This one is great if you have never played keno before and all your friends know exactly what to do. You can quickly and easily pick up the game and before you know it you will be able to pick up a pencil and confidently fill out the form. If one game of keno isn’t that exciting to you, try four in one round. Once you have downloaded Keno 4 Multi Card and opened it for the first time you get a bonus 1500 credits for free, which is obviously a novelty in itself since the game is played with fake money. Pick out of card A, B, C, and D or play all four, betting from one cent to one million dollars per hit. One to 10 numbers are picked on each card and if you hit two to 10 then you win. There’s a custom pay table, as well as the ability to speed the game up and turn the auto play and auto pick on or off located in the options link. 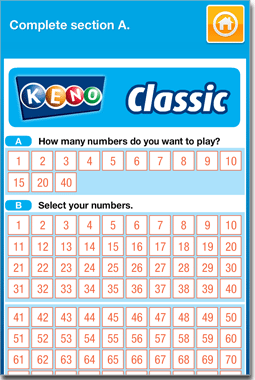 Although you can’t play keno on this app by Tabcorp Holdings, you can check the results of live keno games, view the simulated game that is on the pubs and clubs’ television and use a feature called Kwikpik which randomly picks numbers for you so you don’t have to think too long when filling out your form. 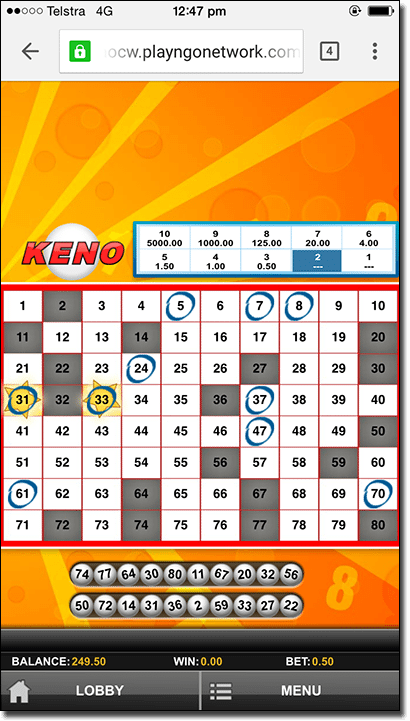 You can also learn how to play keno on this app, by filling out a virtual form, similar to those you would find in land-based keno venues, and then watch as the numbers are drawn out so you can see exactly how players win. You can even play a heads or tail game, which you can then use on your physical form so you don’t have to make the decision of which side of the coin will come up. There is also a scan your ticket feature coming where you can scan your physical ticket. This is a great app to have if you are a regular keno player at land-based venues. For players who want to play keno for real money on their iPhone, they will have to play via your mobile browsers as opposed to downloading an app. As mentioned before, Australian law prevents software developers from creating apps that have real money gambling and therefore you will not be able to find any in the App Store. However, Safari can access online casinos due to most having the ability to be mobile-friendly. There is no need to download any software as Instant Play mode means games load directly when using the mobile Web browser. 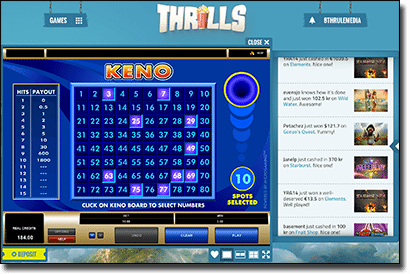 Thrills offers keno in their ‘other games’ section, and it can be played for real money or fun. The graphics are extremely simple and the keno form isn’t similar to that of a land-based venue, but it is easier as all you have to do is click on the number to pick it. You can pick up to 10 numbers in this game and as you pick each number the pay table is adjusted so you can clearly see the chances of winning in association to the pay out. Once you have picked your numbers you can click play and the balls are quickly rolled out. Your spot, or number, will turn yellow with a star around it if it has been matched and you will be paid any winnings. There is also an auto pick option if you want to speed up the pace of the game or can’t choose the numbers, but this will pick you 10 numbers, not any less. Unfortunately, as keno isn’t as popular at table games such as blackjack, the title isn’t as readily available on mobile interfaces as it is on the computer. However, there is a way to combat this if you only have access to a smartphone – load the regular desktop version of the casino website onto your mobile device. For iPhone users, you will need to download Google Chrome Web browser, as Apple’s default Safari browser does not have the necessary plugins. Once on your preferred casino on Google Chrome, tap on the three vertical dots next to the toolbar. There will be an option which says ‘Request Desktop Site’ which you need to tap. The page will refresh and you will be taken to the desktop version on your iPhone. Head to the casino lobby and locate keno in the ‘other games’ tab. Because this workaround involves loading what the casino normally functions as on computers, it can be harder to use as a huge layout is crammed into such a small space on your iPhone. It is, however, good if you do prefer certain online casinos or different variations of keno that aren’t offered via the mobile versions as of yet. Additionally, some websites won’t work even with this function on iPhones. We tried to request the desktop version of Royal Vegas, our favourite online casino, however it needs Adobe Flash to work, something an iPhone does not have. Currently, two of our recommended favourites, Guts Casino and Thrills Casino, work through this method. A smaller screen doesn’t mean you can’t still fund you casino bank account. Transactions are still protected by the data encryption technology which ensures all transactions are secure at our recommended online casinos. Just head to the banking page as you would on your computer and deposit with your preferred payment method, such as credit and debit cards, e-wallets, pre-paid services and more. Playing keno on your iPhone, whether it be for free or for real money, can provide solace when playing iPhone games, because we all know it’s you who becomes angry not the birds.